The latter was adopted as an outcome to the 25 June World Conference entitled “Religions, Creeds and Value Systems: Joining Forces to Enhance Equal Citizenship Rights” held under the Patronage of HRH Prince El Hassan bin Talal of the Hashemite Kingdom of Jordan at the United Nations Office at Geneva. More than 50 Eminent Dignitaries and renowned world leaders from all over the world have signed the World Conference outcome Declaration. “I strongly appeal to international decision-makers to implement the three follow-up actions of the World Conference outcome declaration. The declaration calls for the periodical holding of an annual World Summit on Equal Citizenship Rights, the setting-up of an International Task-Force to review measures implemented by UN member States to promote equal citizenship as well as the inclusion of a special item in the Universal Periodic Review (UPR) state report to monitor the implementation of these measures. 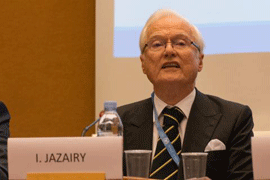 The World Conference outcome declaration underlines therefore that equal citizenship rights is the gateway to world peace,” Ambassador Jazairy said. In this context, he praised the decision of the European Centre for Peace and Development – UN University of peace to unanimously adopt a resolution at the XIV International Conference on “A New Human Concept of Security” held on 26 October in Belgrade endorsing the World Conference outcome Declaration.